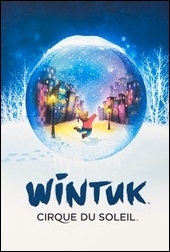 The story of WINTUK (pronounced: win-took; amalgamating the English word "winter" with Inupiaq phonetics), Cirque’s "Winter Tale" for children, begins with an announcement on November 20, 2006 by Guy Laliberté; Hank Ratner, Vice-Chairman of Madison Square Garden and Cablevision Systems Corporation; and Jay Marciano, President, Madison Square Garden Entertainment eluded to a show with a narrative thread and a storyline designed to present the theme of Winter. The production was created specifically for the Theater at Madison Square Garden and would run for ten weeks for the next four years each winter, beginning in 2007. The creative team would use traditional stage techniques and the very latest in theater technology to bring the audience of nearly 5,000 as close as possible to the performers. And there would be an emphasis on color, music and comedy as well as the customary circus arts the public had come to expect from Cirque. Wintuk became an enchanting winter tale about a boy and his quest to find snow and adventure. Wintuk lives in a city where the arrival of winter has brought long shadows and intense cold - but no snow! He interacts with an extraordinary cast of high-energy urban street characters, including acrobats, dancers and talking marionettes. But when the snow does not arrive, he embarks on a quest with three companions - a female shaman who's lost in the city, a shy man destined to discover his courage, and the shadow of a young girl - to find the snow and bring it back to where it belongs. The adventurers journey to an imaginary Arctic - a world without sunlight - where they encounter the rich culture of the People of the North and extraordinary giant characters made of ice. When at last the sun returns, they fly home on the wings of a giant crane and generate a swirling snowstorm. The show is playful, musical, and bursting with the energy of the city and the broad sweep of nature. A cast of 50 performers weaves thrilling circus arts, breathtaking theatrical effects and memorable songs into a meaningful seasonal story that resonates with the whole family.